Two dead as India building collapsed – 150 trapped! At least two people have died and dozens are feared trapped under rubble after a building site collapsed Tuesday in India’s southern Karnataka state. 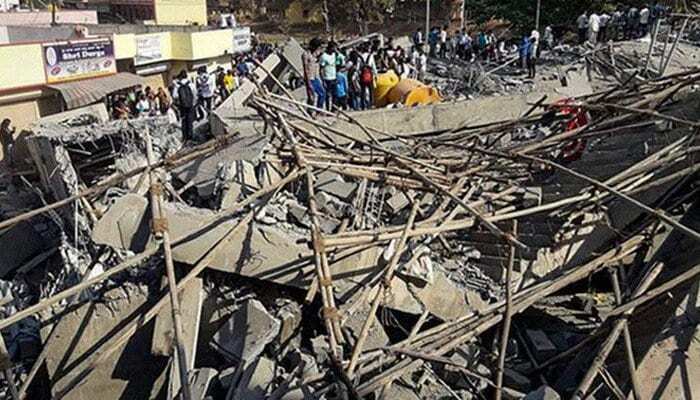 Rescue teams and ambulances were at the scene in the Dharwad district, roughly 700 kilometres (430 miles) northwest of the state capital Bangalore, where the five-floor under-construction building crumbled. A thick blanket of dust and debris engulfed the area after the five-storey building collapsed. Locals fear many more are trapped under the rubble of the collapsed building. Desperate family members rushed to the site and began searching for loved ones trapped in the rubble and joined the search and rescue efforts. Locals have estimated a further 150 people are beneath the rubble. “Two people have been killed in the collapse. We have pressed in men and machines to rescue those trapped,” Srikant said, the district’s regional fire and emergency officer. Nagesh D.L., the district’s deputy commissioner of police, said 27 people had already been recovered from the rubble and taken to the hospital, but emergency services were working through the night to get to as many more as possible. Rescue operations were expected to continue throughout the night. This is not the first a building has collapsed in India, commentators are calling for stricter legislation to ensure health and safety practises are followed. Critics say many private builders use inferior construction material to cut corners on costs or bribe officials to bypass regulations. Last September five people were killed after an apartment block collapsed in Delhi. Just months earlier a six-storey building collapsed on the outskirts of the capital, killing nine. Millions also live in dilapidated old buildings, many of which are susceptible to collapse during rain.